DALLAS, TX (FWAA) – Clemson’s Daniel Rodriguez is the first weekly nominee for the 2012 Discover Orange Bowl-FWAA Courage Award, to be announced at the end of the season. Rodriguez, a redshirt freshman receiver from Stafford, Va., is playing for the Tigers after earning a Purple Heart and Bronze Star in Afghanistan.Rodriguez, 24, was wounded Oct. 3, 2009, during a battle near Kamdesh, Afghanistan, while serving in the U.S. Army. Combat Outpost Keating, in a mountainous region near the Pakistan border, was ambushed by nearly 300 Taliban insurgents. Eight Americans were killed; 22 were injured. Rodriguez was shot and wounded in the leg, neck and shoulder.Once recovered and discharged from the military, Rodriguez kept a promise to his friend, Pfc. Kevin Thompson, who was killed during the initial moments of the attack. Rodriguez had told Thompson if he made it home from Afghanistan, he would find a way to play college football.After enrolling at Germanna Community College, he began training for football. He sent a video of himself catching passes, spliced with video he’d shot during combat, to four-year schools. Clemson coach Dabo Swinney offered Rodriguez a spot on the team.”I was mesmerized by his video,” Swinney told The New York Times. “I’m watching and thinking, ‘Holy cow, he’s amazing. '”Rodriguez enlisted in the Army after high school shortly after the unexpected death of his father, also an Army veteran. He served from 2006-10, spending 18 months in Iraq and a year in Afghanistan. 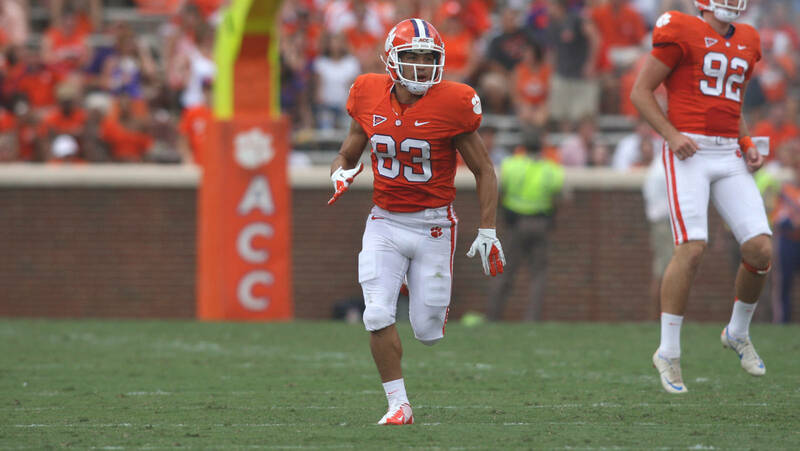 He is attending Clemson on the GI Bill.The 5-8, 175-pounder has played on kickoff coverage in the Tigers’ first four games, and saw action at receiver against Furman and Ball State.”You always dream of that second chance to play football again,” Rodriguez said. “I’m in that position. I have that second opportunity that so many people have said, ‘I wish I could get one more shot.’ Well, now it is my shot. I have that opportunity.”For the seventh straight year, the Football Writers Association of America and the Discover Orange Bowl will announce a weekly nominee each Wednesday during the season. A blue-ribbon panel will determine the winner from all of the nominees. The winner of the Discover Orange Bowl-FWAA Courage Award will be announced in December and be presented with the trophy during the week of the 2013 Discover BCS National Championship Game. The Courage Award was created by ESPN The Magazine’s senior writer Gene Wojciechowski, also an FWAA member. A select group of writers from the FWAA vote on the winner each year. The requirements for nomination include displaying courage on or off the field, including overcoming an injury or physical handicap, preventing a disaster or living through hardship. Previous winners of the FWAA’s Courage Award are Michigan State offensive lineman Arthur Ray Jr. (2011), Rutgers defensive tackle Eric LeGrand (2010), the University of Connecticut football team (2009), Tulsa’s Wilson Holloway (2008), Navy’s Zerbin Singleton (2007), Clemson’s Ray Ray McElrathbey (2006), the Tulane football team (2005), Memphis’ Haracio Colen (2004), San Jose State’s Neil Parry (2003) and Toledo’s William Bratton (2002).